Take some time to see what some of our teachers and customers have to say! 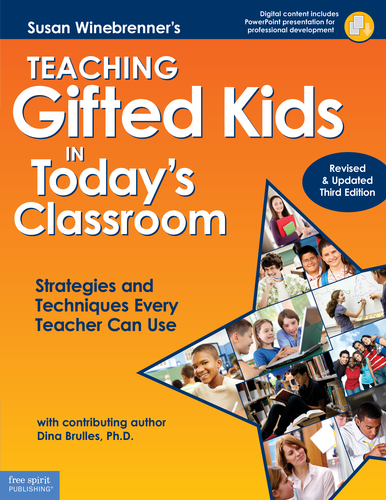 This book is a classroom teacher's treasure box of ideas and tools for all learners. Just open and let the magic begin. You could be at the beginning of your career or have many years' experience and still benefit greatly from the wonderful ideas shared. It is one of the biggest time savers ever. The extension lessons provide ways for meaningful learning to continue, not stop when the main lesson is complete. All areas of curriculum are supported with a variety of activities. This makes it possible to meet the individual needs of all students. The flexibility rendered in these extensions allows for the same number of possibilities as the number of students you teach. "Susan Winebrenner and Dina Brulles give us a red-hot winner in The Cluster Grouping Handbook. The Handbook is a guide for schools with limited budgets to create a workable, defensible gifted program, and for schools with tons of funds (are there any?) to simplify their teachers' jobs and maximize all student lea, not just gifted student learning....The Cluster Grouping Handbook is a one-stop solution to a variety of the education challenges of today, and Winebrenner and Brulles' easy-to-read, easy-to-use guide is a winner that should be implemented in every school to save money and improve education for all students. This book shouldn't be on your school's bookshelf; it should be in the hands of your teachers, coordinators and administrators, as they train and implement Cluster Grouping using this guide!" If you can buy only one book to increase your success in teaching students with learning difficulties, whether or not they have been formally diagnosed, this is the book you want!! If you are the parent of this type of learner, this resource will help you know exactly what accommodations to ask for when you talk with your child's teacher! Totally practical and easily understood, this book will allow you to make helpful accommodations almost instantly. "I've been a teacher for 27 years, and have been using Susan Winebrenner's book in my work with fellow teachers for the past 15.years. This updated version is truly worth investing both your time and money. All of the practical techniques from the first versions of the book are here, plus the authors incorporate the groundbreaking principles from Carol Dweck's book Mindset, offer ways to navigate the Common Core and other standards (that can feel frustratingly constraining to creative minds), and give important information about organizing the school environment to meet the needs of gifted learners. The authors have an engaging writing style - as one of my teacher friends commented, "It's as if she knows my classroom!" This has been my go-to resource, and has made a big, daily difference in the lives of my students. Highly recommended!" "I once met this woman (Susan) in Milwaukee. She and I went to lunch a few times. I know she was a committed fifth grade teacher but never thought she would be so successful later in life. Listen to what she says. I have! And I am a better person for it." As a student in the primary grades, this student was on the Autism Spectrum and also extremely gifted--especially in math. He had a photographic memory for words and spelling. He would refuse class work that involved any form of writing or coloring. He would crawl under tables, yell at teachers, become aggressive, and leave the room without permission He was unmotivated by tangible items or positive attention. Although we had classes for gifted students, both the school and parent agreed not to put him in high ability because they felt it was too unstructured. His problematic behaviors continues un--abated. When he was in 4th grade, we finally placed him into a 3rd/4th split gifted class. Un that setting, his Inappropriate behaviors didn't gradually go away, they just stopped. In this environment, he could show the teacher what he already knew in a few examples and move on to something new. He enthusiastically investigated robotics and engineering during this independent study time. As an 8th grader, he continues to be positively motivated, and is now thinking about what career is in his future. Being able to access strategies designed for gifted students has caused positive changes in his life and the experiences of his parents and teachers. Our district has used this model very successfully for several years. It actually does lead to higher achievement for most students, yet all classes are totally heterogeneous. The authors will share the research data upon request, We are particularly pleased with the positive effect the program has had on our special education students. We have also been able to enfranchise our atypical gifted learners in the described program call The Schoolwide Cluster Grouping Model (SCGM). The model includes the following groups of students in the gifted cluster classes: Twice Exceptional, Primary age, Non-productive, Creative thinkers who do not usually follow directions , Culturally and Linguistically Diverse (CLD) Students with Behavioral Issues Children from Poverty, and others.